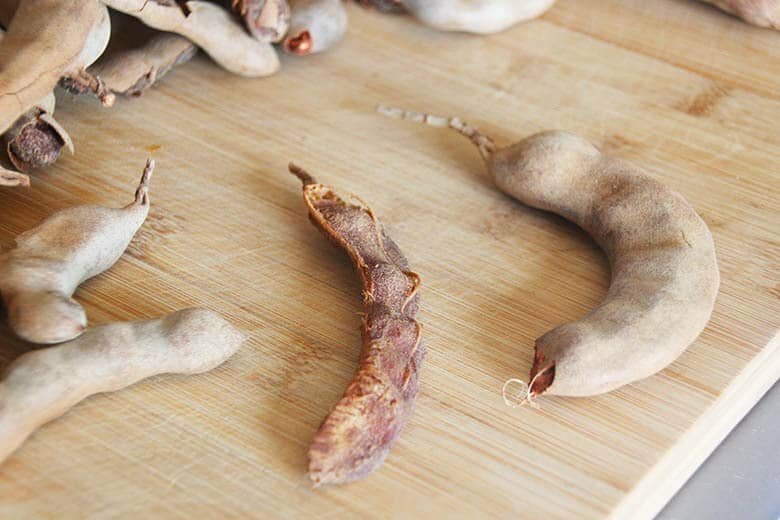 Everything you need to know about tamarind and how tamarind paste is made from fruit pods. 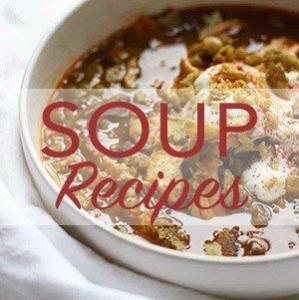 Use in curries, pad thai and your other recipes to perfectly balance sweet and sour. 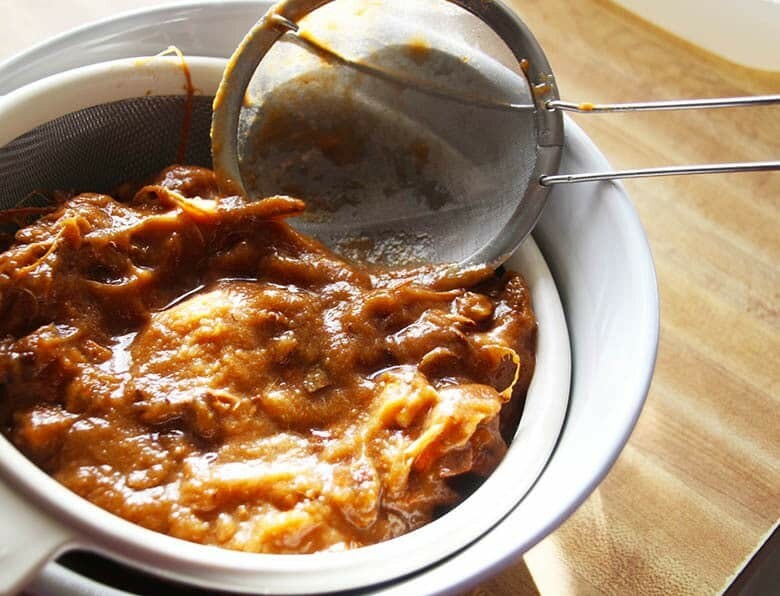 Learn how to store your tamarind paste too. Embrace the tamarind, your best secret ingredient you didn’t know you needed. Discovery is a great passion of mine. I love to find cozy nooks, unusual bookstores before they all went out of business and international markets. The mysterious ingredients always feed my curiosity. I adore second hand stores and antiques stores too. Besides admiring vintage and antique items from bygone days, you just never know what you are going to discover. The first time I saw tamarind in any form was along the Mexican Border. Somebody was selling tamarind suckers. I loved the fruity tartness of it. Fear not my intrepid community, there is no big mystery here. We are going to de-construct tamarind paste together. Tamarind is a shrub that grows very tall and produces fruity pods. These pods have a hard shell covering a fibrous and seedy pod. Tamarind is good for you too. Tamarind is high in iron, magnesium and phosphorous. Tamarind originates in Africa but has spread effectively throughout Arabia and India. Later, in the 16th century, settlers brought tamarind to Mexico where the population quickly incorporated the fruit into their cuisine. It is a tropical shrub so, sorry my fellow Utahn’s. The wood is beautiful when infected with a mold. Spalted tamarind is one of favorite woods that Mr. Craftiness works with. 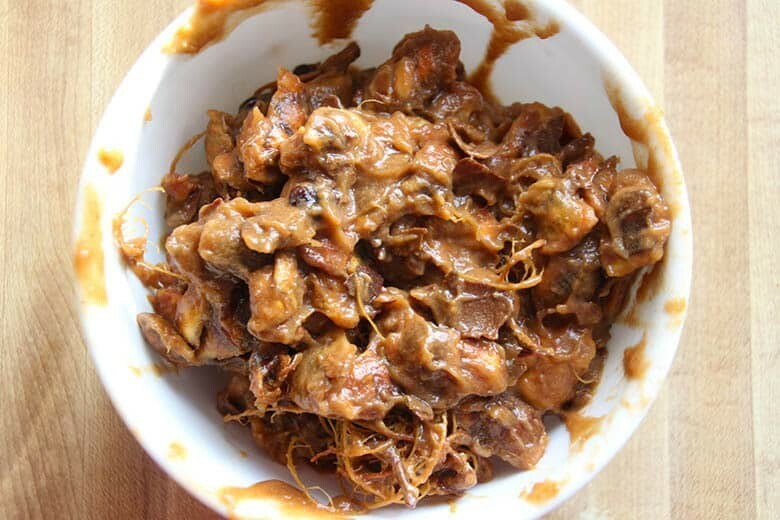 How to make tamarind paste from pods? It is somewhat a laborious task but don’t fret, it’s great to do with others. Have you ever seen a group of women sit together and assemble tamales? It’s like a coffee klatch or Scandinavian Fika where a group of women congregate and kvetch or share dreams. 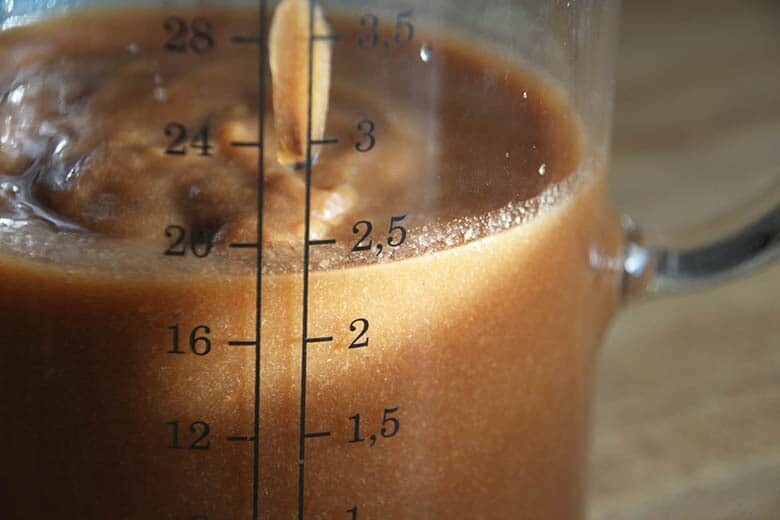 Organize your own tamarind Fika, and make enough tamarind paste to last a year. In fact, when you do this, take a pic of your group and post on Instagram #TamarindFika. This could be fun! Plus, you will have enough tamarind paste for a year! First you crush the hard shell and peel with your fingers. Toss out the shell. Place the fruity pods without the shell in a large bowl. Barely cover these pods with water for 20-30 minutes. Next, after washing your hands, massage this bowl of tamarind and work the fruit away from the seeds and fibers with your hands. Keep working the fruit away from the seeds. The more you massage the pods, the higher the yield. Place this fruity mess in a sieve over a bowl and press. You want to press the pulp through the sieve and leave the seeds and fibers behind. Pour the sieved pulp into ice cube trays and freeze. 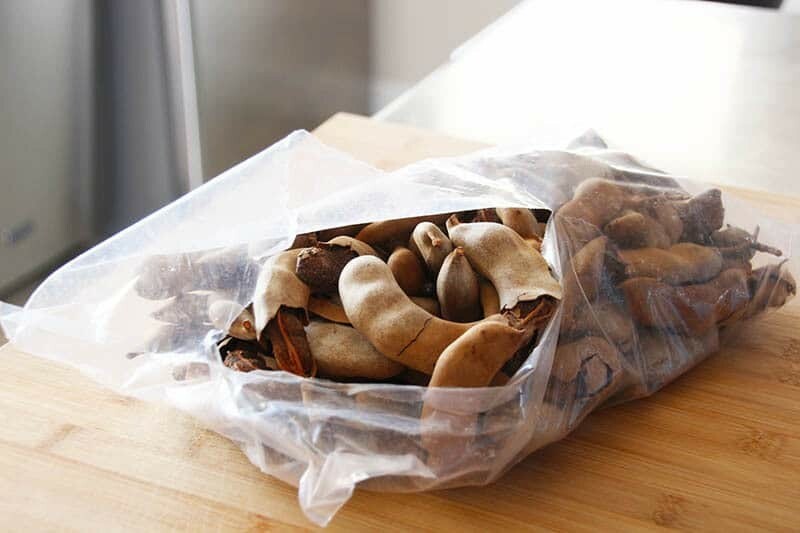 Once solid, place the tamarind cubes in a freezer bag and store in the freezer for up to a year. Since tamarind is used in Africa, the Middle East, India, Southeast Asia and Mexico, it goes surprisingly well with the cuisines of those areas. Just remember that it give a sweetish, sourness to any dish as an add-in ingredient. It is almost never the star of a recipe but very well could be. It’s molasses like flavor makes this versatile ingredient a big winner in my book. Explore and go wild with these amazing suggestions. add some to a whiskey cocktail, shoot. Why not? This is simple and you probably do this already with tomato paste or fresh herbs. Pour into ice cube trays and freeze until solid. When solid, dump into a freezer bag, squeeze the air out and freeze for up to a year. Simple. You can skip the pesky chore of shelling tamarind pods buy a block of tamarind paste in an Asian or Indian market and just soak in warm water. Press the mixture through a sieve after massaging it. Done. I like to use fresh squeezed lime juice and some brown sugar in equal parts as a substitute. The lime adds the sour and the brown sugar adds the sweetness with a hint of molasses flavor. I found tamarind pods in a Mexican market in Orem, Utah. I have seen tamarind blocks in both Southeast Asian markets and Indian markets. 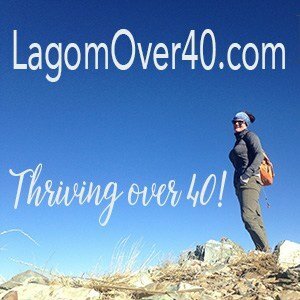 Keep your eyes open and I am confident you will find this little hidden gem you didn’t know you needed. The first step is to peel the hard shell from the fruit pod. The tamarind fruit shelled and un-shelled. 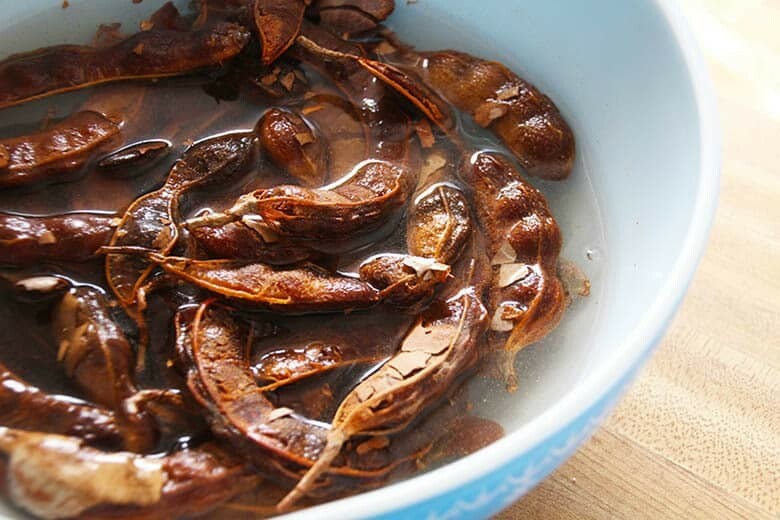 The second step to making tamarind paste is to soak the shelled pods in water. Massage the fruit after soaking in water for 20 minutes. The seeds and fibers will separate from the fruit. Place the pulp with the seeds and fibers in a mesh strainer over a bowl and press the fruit through the strainer. The paste will collect in the bowl underneath and the seeds and tough fibers will be left behind. Discard the seeds and tough fibers. I was able to make about 2 1/2 cups of tamarind paste from that large bag of pods. 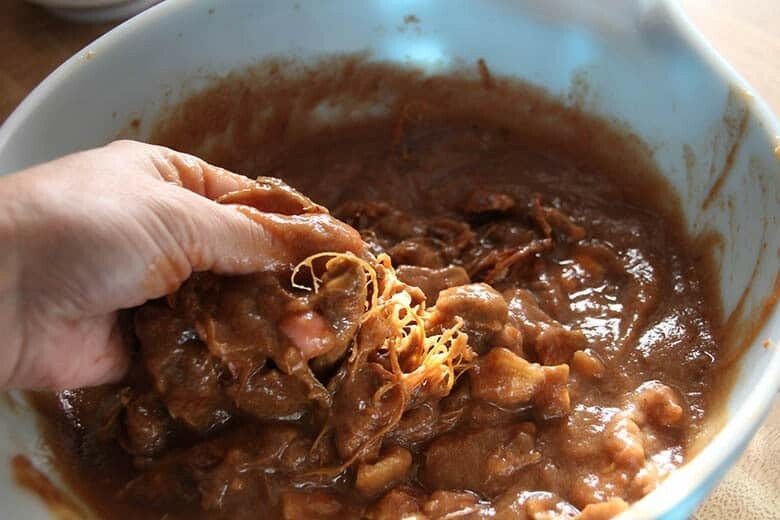 Place tamarind paste in ice cube trays and freeze. 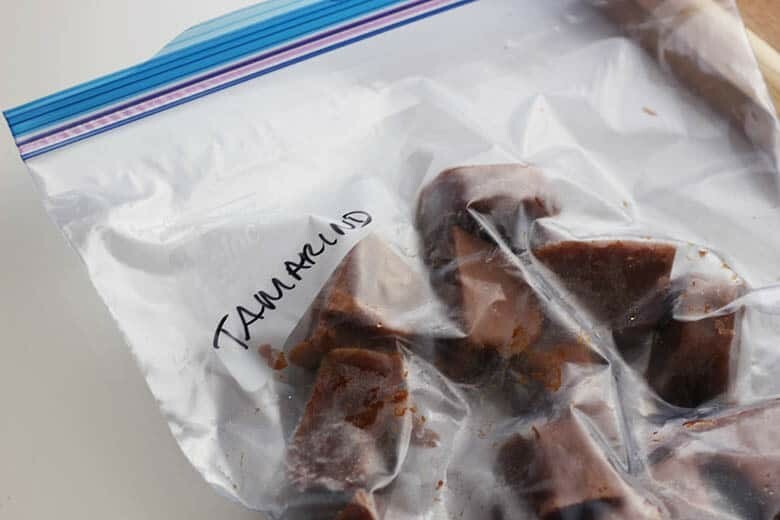 Then place tamarind paste cubes in a freezer bag and keep in the freezer. A years worth of tamarind paste is ready to go for all of your delicious recipes. 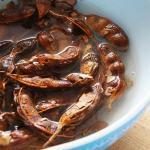 Learn how to make, store and use tamarind paste. Crush and peel and the hard shell from the tamarind pods. 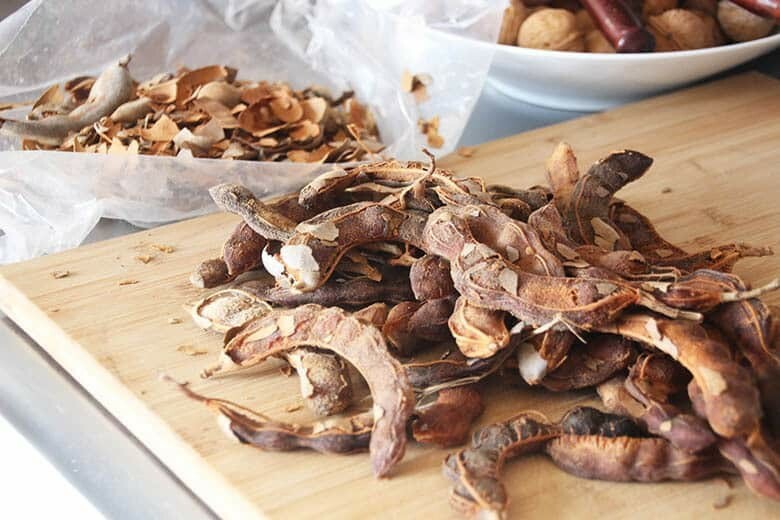 Place peeled tamarind pods in a largebowl. Add enough water to cover slightly in order to soften the fruit. Massage the fruit vigorously in order to separate the seeds and tough fibers from the fruit. Place everything in a mesh strainer over a bowl and press the softened fruit through. The fruit pulp in the bowl is your tamarind paste. Pour tamarind paste into ice cube trays and freeze. When frozen solid, place in a freezer bag and store in the freezer. These will last up to a year. Thank you so much for these great instructions. I live in a small SW Texas town that is 3 hours away from any decent sized city. I can find the pods easily and love asian food so now I can make my own Tamarind paste without ordering online! I grow my own Birds eye chili’s, lemon grass, Thai basil etc. on my patio and I really like having this ingredient that will now be easily available to me! Thanks for the freezer tip I do that alot but I’m not sure if I would have thought about doing that for this recipe. This looks messy but so much fun. I want to try this. 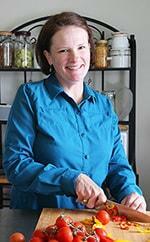 I love the freezer method too! You should try this Bianca, so easy! I’ve never tried tamarind paste! I can’t wait to try this homemade version. It sounds perfect for so many dishes! I just live under a rock, I’ve never heard of this pod before. I do like the sound of a lime and brown sugar combination for a glaze topping like you suggested. If it replaces those flavors than I can’t wait to give it a try! I don’t know about you Brandy but half the fun of cooking is discovering new ingredients. Have fun with this one!